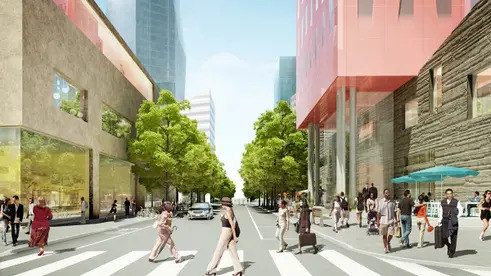 Waterline Square will break free from the post-modern drivel that has straitjacketed much of the Riverside South Master Plan —a plan, half-century in the making. The vision promises three contemporary buildings with 1,100 condo and rental units, developed through a partnership between General Investment and Development Companies (GID) and Henley Holding Co. 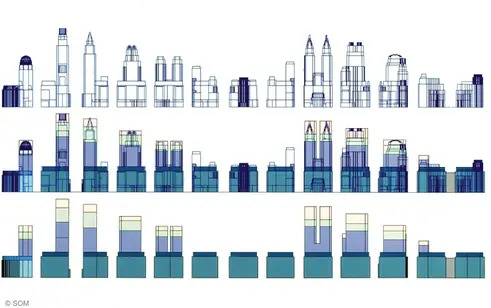 The enlisted designers are among the most favored in the city and include Richard Meier & Partners, Kohn Pedersen Fox and Rafael Viñoly Architects; Hill West will serve as executive architects on all the new buildings. After months of foundation work, cranes have been erected to begin construction on these great towers. 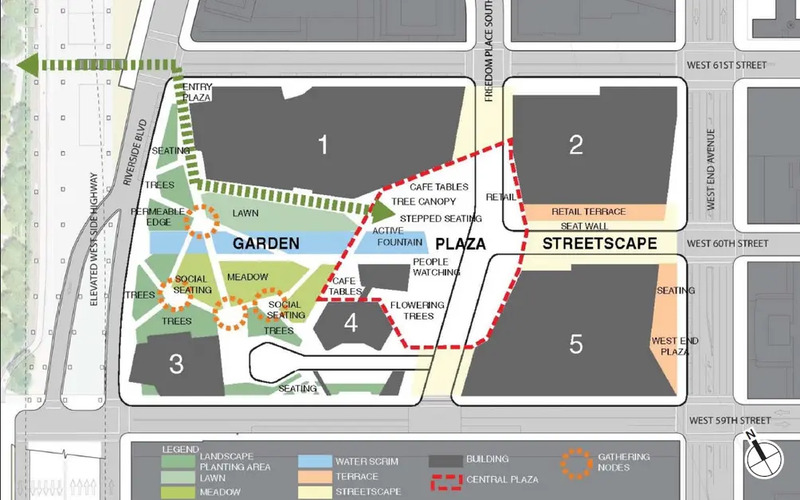 Waterline Square is the final phase of the final phase of the Riverside South master plan —a confusing detail that doesn't add to the arrayed nomenclature of the project's surrounding; this includes Trump Place, Riverside Center, Riverside Boulevard, and now, Waterline Square. 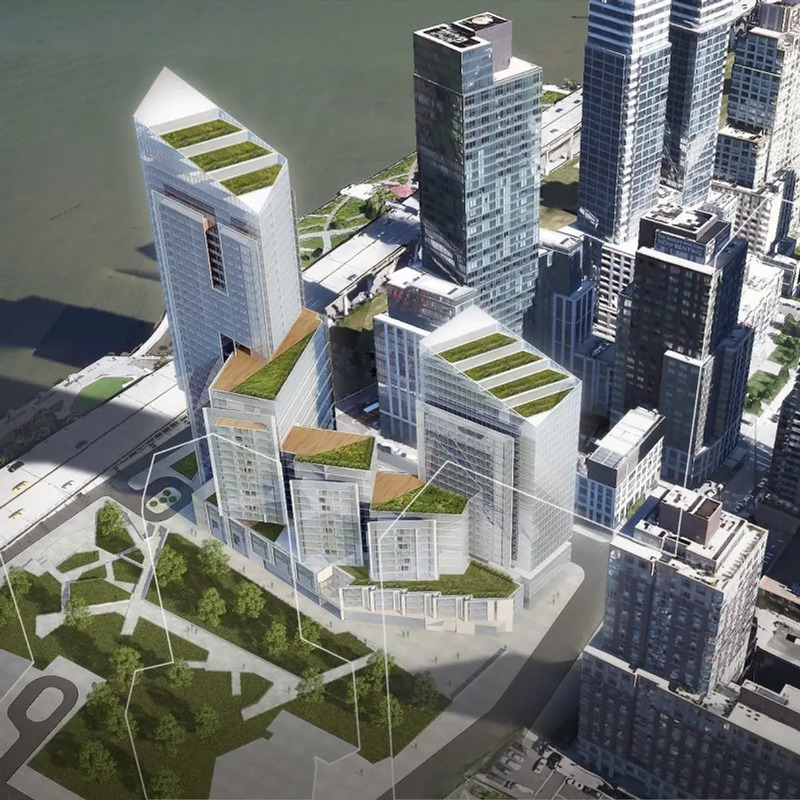 Of the four, Waterline Square rises on the southwestern-most portion of Riverside South: a 77-acre plot of land that shoulders the Hudson River from West 59th Street to 72nd Street, and was once home to a freight rail-yard owned by the Penn Central Railroad. With the city’s manufacturing and maritime industries were in decline, in 1962, the cash-strapped railroad, along with Amalgamated Lithographers Union, proposed to build a mixed-use 12,000-unit development called Litho City. The plan was never realized and the land was acquired by President Donald Trump in 1974. Trump sold the site soon after to an Argentinian developer who sought to execute a Rafael Vinoly-envisioned, 22-building master plan. 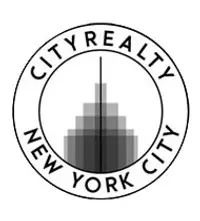 The developer went belly-up, as nearly did the city, and Donald Trump repurchased the site in 1985 for $100 million, in partnership with developer Abe Hirschfeld. 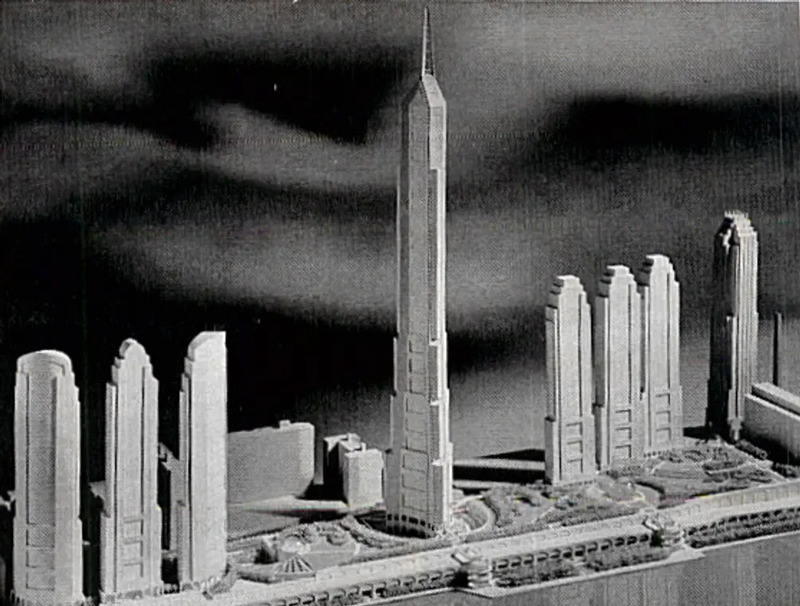 In 1986 Trump proposed a 14.5-million-square-foot development named Television City. 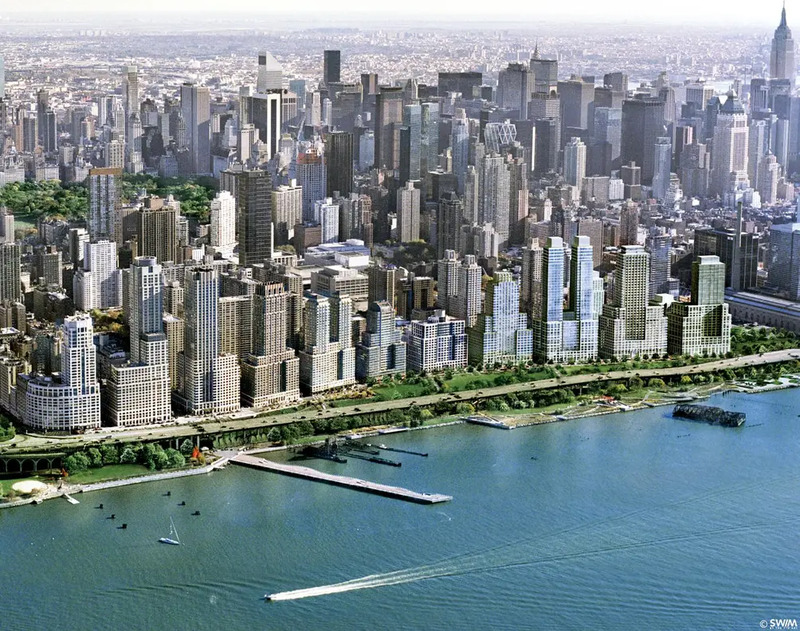 The plan designed by Chicago-based Helmut Jahn would have new studios for NBC, 7,600 apartments in 60- and 70-story towers, a regional shopping mall, a 40-acre park, and as its centerpiece: a 150-story, three-pronged tower that would be the tallest in the world. The name Riverside South was conceived by a group of civic organizations in 1989 who were rallying against Donald Trump’s grandiose proposal. Shortly after the Riverside South plan was approved in 1992, Trump faced bankruptcy and sold the site to a group of Hong Kong investors. Like many ventures bearing the Trump name, the developer would remain as the public face of the project and its first buildings would be proudly emblazoned with 'Trump Place' (in gold, of course). 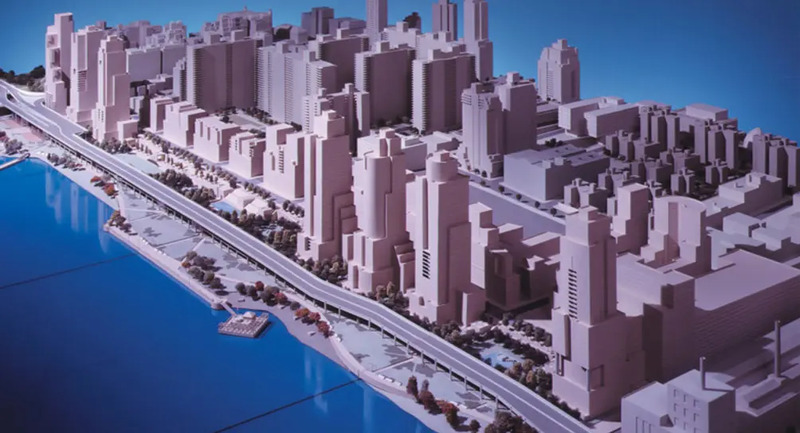 The approved plans, negotiated with the community, recommended that the building designs and massings evoke the Central Park West skyline —ultimately giving Trump’s buildings a contrived and stage set appearance. The Trump towers comprised three rental buildings, at 140, 160 and 180 Riverside Boulevard, and three condo towers, at 140, 220, and 240 Riverside Boulevard (The Heritage). In 2009, the Hong Kong investors sold the land to Gary Barnett’s Extell Development and the Carlyle Group for $1.76 billion, prompting Trump to file suit against his Hong Kong partners for allegedly underselling the site. The three rentals were later sold to Equity Residential, and recently, after the successful petition of residents, had the Trump name was finally removed. 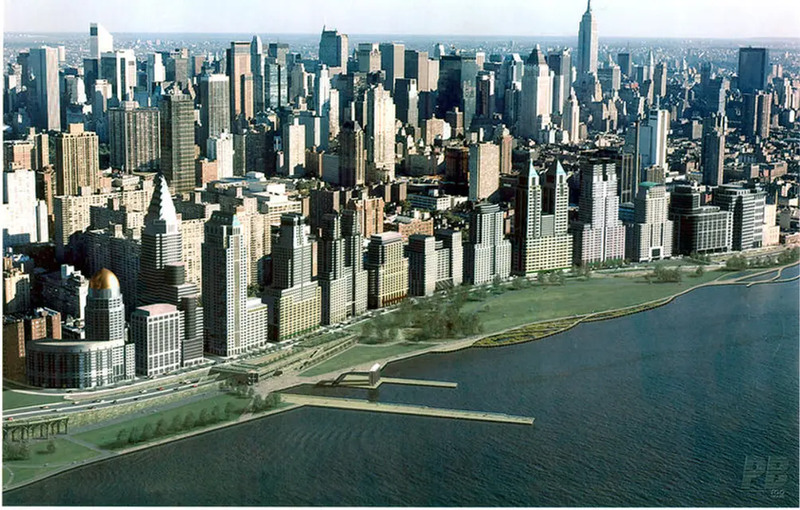 Extell Development would go on to build the Avery at 100 Riverside Boulevard, the Rushmore at 80 Riverside Boulevard, the Aldyn at 60 Riverside Boulevard and One Riverside Park at 50 Riverside Boulevard (the “poor door” building). The southern 8-acre parking lot, bound by 59th and 61st Street, West End Avenue and the river, was reserved for 1.8 million square feet of commercial development; first to be anchored by NBC television studios and then Columbia University. 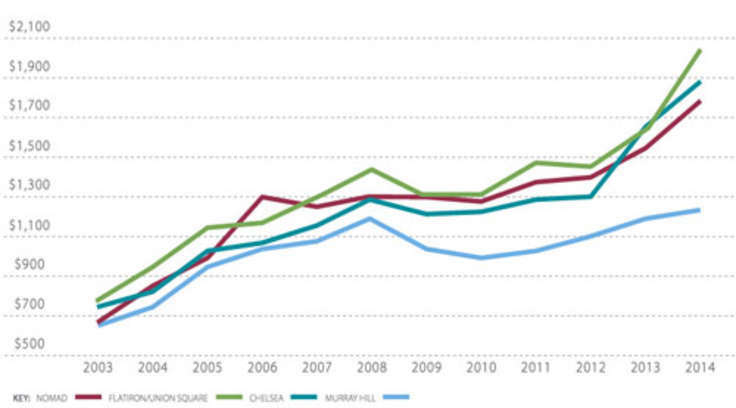 In 2009, Extell sought to rezone the superblock to dramatically increase its residential potential. Dubbed Riverside Center, drawings flaunted a crystalline cluster of 5 towers sculpted by One57-designer Christian de Portzamparc. 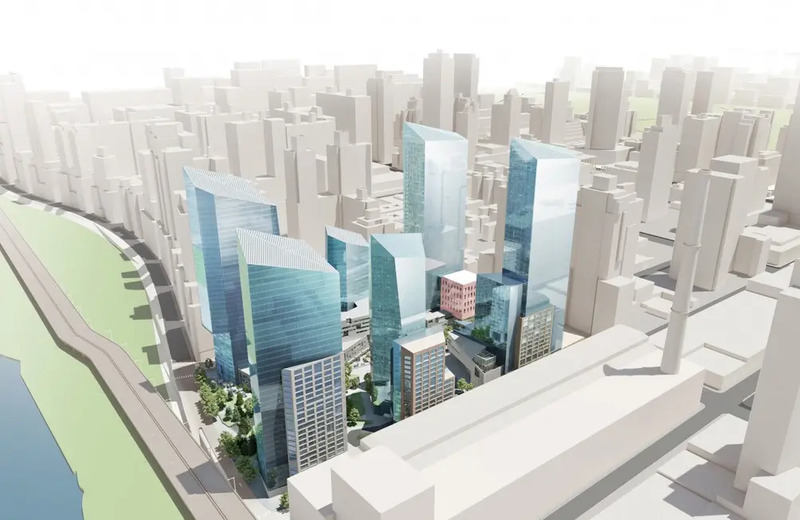 The plan was to include 2,500 apartments (20% affordable), a 250-room hotel, 104,000 square feet of office space, and a kindergarten-through-eighth grade school. The City Planning Commission and City Council gave the green light to rezoning in 2010, praising both its design and the embedded affordable housing units. After successfully rezoning the site, Extell sold off all of Riverside Center’s parcels to various developers. The first building opened last year at the northeast corner of the block at 21 West End Avenue. Developed by the Dermot Company and the Carlyle Group, the building comprises of a pre-K through 8th grade school and 616 rental apartments. Next door, at the southeast corner of the superblock a shimmering condo tower One West End is being developed by Elad and Silverstein Properties. Still under construction, the building is designed by Pelli Clarke Pelli with Jeffrey Beers as the interior designer. 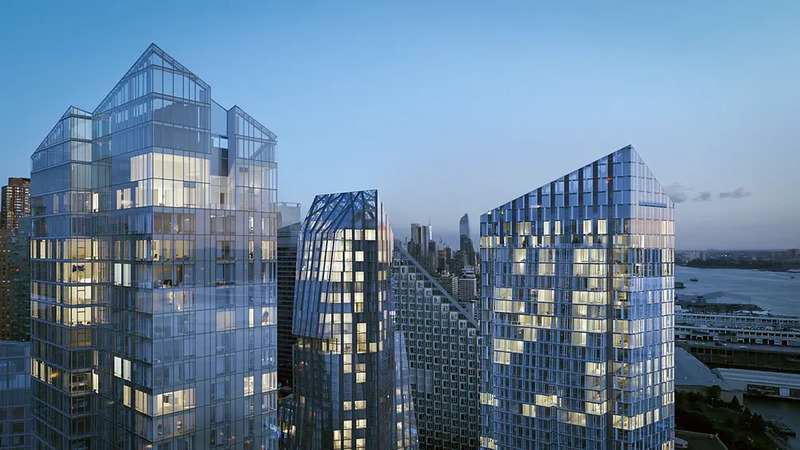 The building will hold 246 condos over 42 stories and has been dubbed one of the fastest selling condos in Manhattan, with units averaging above $2,000 per square foot. Extell sold the remainder of the Riverside Center superblock to Boston-based GID for $676 million. 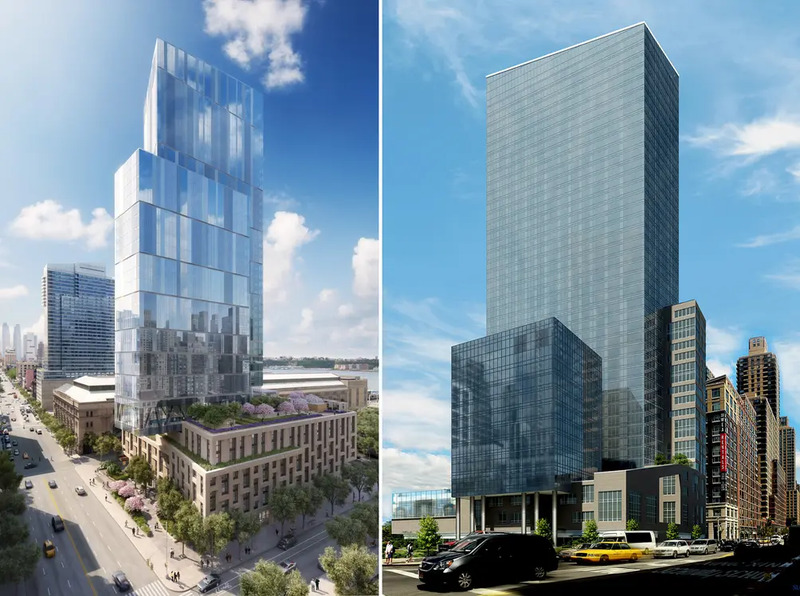 All three of GID’s forthcoming towers: One, Two and Three Waterline Square are anticipated to rise in 2019, with sales of the condos expected to launch later this year. Specific details on each of the buildings have yet to be released but they will all have one- to five-bedroom units, with rentals in the bases and condos above. Per the Waterline Square teaser website, the development will have more than 100,000 square feet of lifestyle, sports, and leisure amenities. 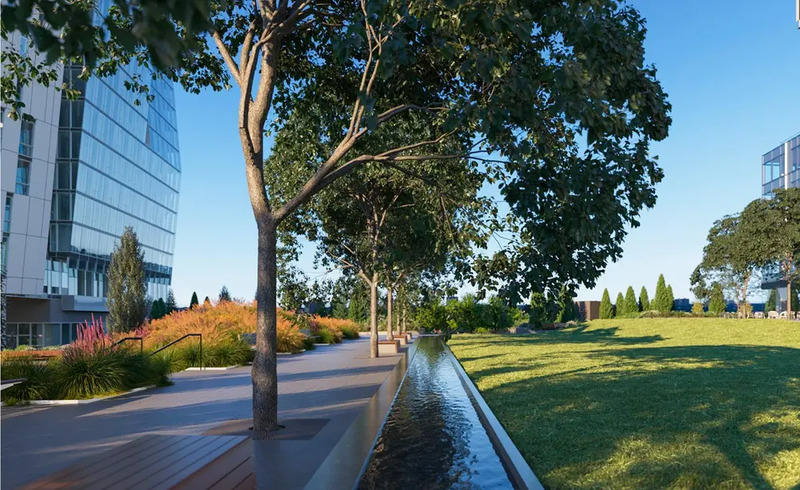 The towers will encircle a public park designed by Mathews Nielsen Landscape Architects which will connect to the Riverside Park South esplanade on the Hudson River. 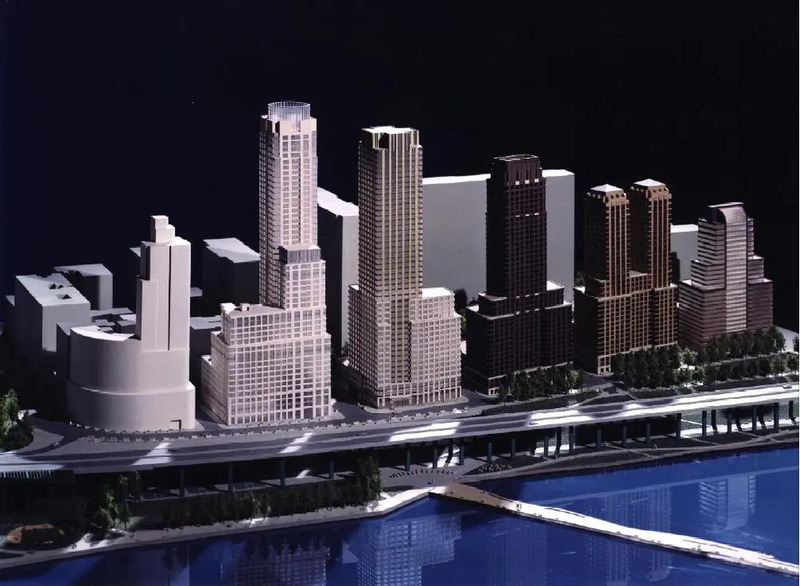 One Waterline Square is being designed by Pritzker Prize-winning architect Richard Meier & Partners and rises at the block’s southwest corner at West 59th and the the to-be extended Riverside Boulevard. 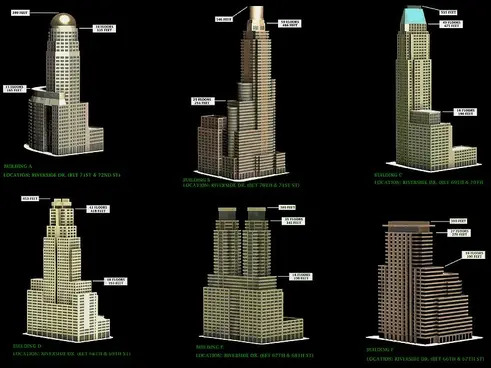 The enigmatic building will rise approximately 430-feet tall and 288 units will be spread across its 36 floors. Two Waterline Square is being designed the supertall-aficionados, Kohn Pedersen Fox (KPF). The two-towered building will be Riverside South’s largest and hold 696 residential units along 38 floors, according to filed building applications. 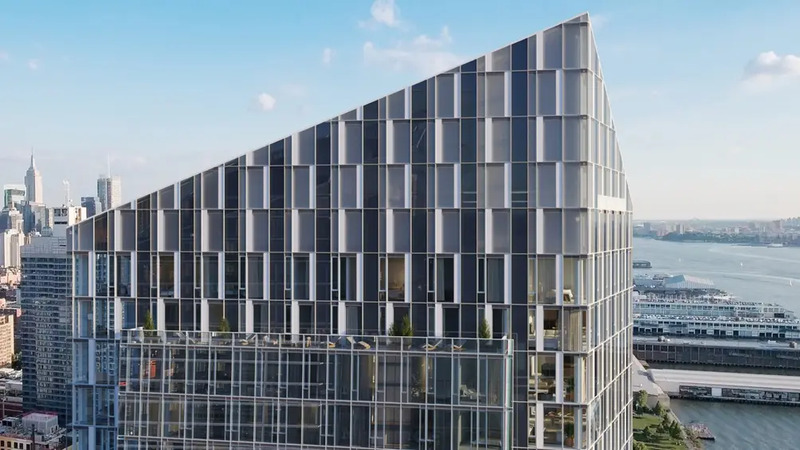 Straddling the blocks of 61st Street edge, the buildings' massing will be broken into a collection of smaller volumes each topped by a landscaped roof deck. 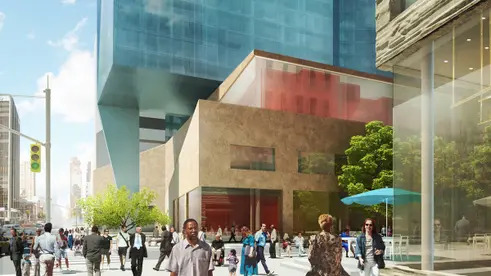 Finally, the design of Three Waterline Square is being designed by 432 Park Avenue-architect Rafael Vinoly Architects. The building is positioned midblock along West 59th Street between One West End Avenue and One Waterline Square. Its sculptural form is a great departure from Vinoly’s right-angled towers springing up throughout Manhattan. 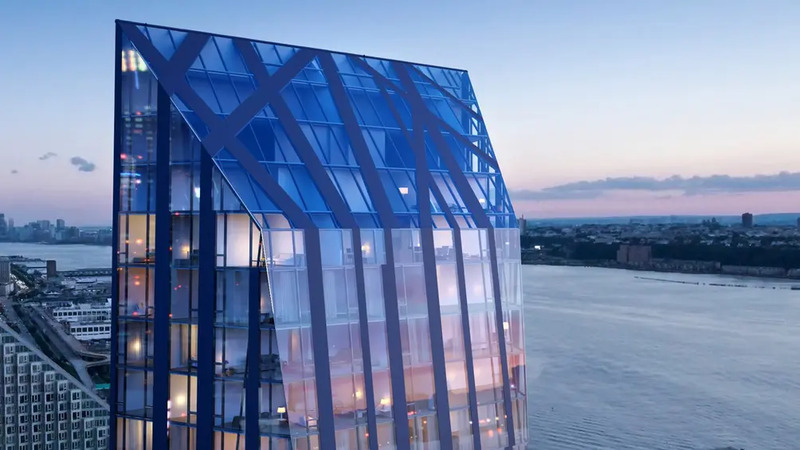 The drunkenly pinstriped building will rise 34 stories and hold 244 units —its bottom flared outward and its top sloping inward to create a glass-enclosed sky room, shattered by a cobweb of structural elements.